Here is the good news for all Oneplus one users who are waiting for the Android 6 Marshmallow CM13 ROM update. Now the Official CM13 (Android 6 .0.1 Marshmallow) build are live now and available for the download. The new CM 13 build is based on the new Android 6.0.1 Marshmallow and comes with lots of new features and security features. There are so many unofficial builds are available on the market, but this one is the official build directly from the Cyanogen team. Interested user can flash the new CM13 ROM on the Oneplus one and enjoy the new features. 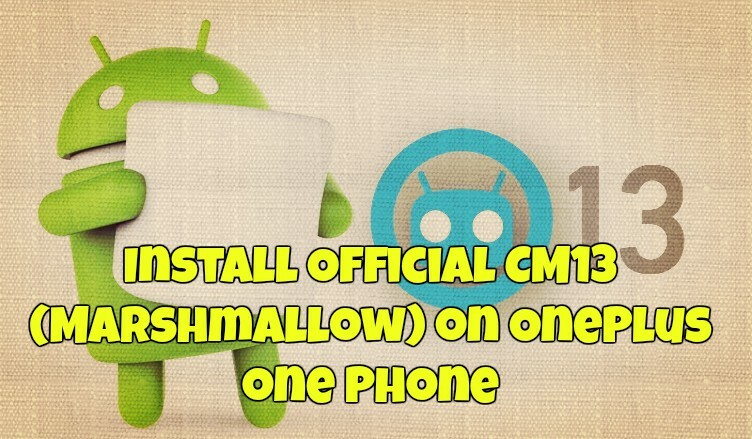 If you are new and don’t know how to install the CM 13 ROM on Oneplus One, here is the simple guide which you can follow on your phone and install the same in simple steps. To apply this ROM, you need a Rooted Oneplus One with the TWRP recovery to flash the ROM and Google apps zip file. Before following the below mention tutorial read all the step very carefully and do take the full backup of your one plus one phone. Remember this guide is only for the Oneplus one users and don’t try this method on any other android phone or tablets. Step 1. To get started you need a rooted Oneplus with TWRP recovery. Here is the guide to root Oneplus one and Install TWRP. If you already done that, then leave this step and follow the step 2. Step 3. Now Download Android Marshmallow compatible Google Apps here , You need this zip file to install all the Google application on your Oneplus one. Step 4. Once both the Zip files are saved on your phone. Boot your Oneplus into TWRP Recovery Mode. To do this Turn off your phone and Turn on the phone while holding Power and Volume Down buttons. Step 5. From the TWRP recovery main menu, Go to Wipe and select Swipe to Factory Reset Option, This will wipe cache and dalvik cache form your phone. Step 6. Now go back to main menu of recovery and go to Install and find the zip files you saved on your OnePlus one Internal memory. Step 8. From here, Select the CM 13 ROM.zip file that you downloaded on step 2, after that select Add more zips option and select GApps.zip > Swipe to flash. Step 9. Wait for the flash to finish and press Wipe Cache & Dalvik. Step 10. Press Back and press Reboot System. First boot will take some time, wait for 5 minutes to apply the CM 13 update on your phone. Now your phone is running on the official CM 13 Android 6.0 Marshmallow. Enjoy! Will we get this as OTA update? Installed this on OPO and cant connect to serviceprovider, any sugestions? now you can go into recovery again holding vol- and power to boot the phone, and flash any rom for opo. If its Nightly ROM, its not official. Nightly is for testing only and they release updates every week. Hi, I just got this OTA via OPO and once the updates were installed the lock screen came on. I entered my PW and clicked the submit button. For a second the screen unlocked and then the phone crashed. It won’t come back on now and I have waited for about ten minutes, nothing is happening and no response to holding or pressing power button. Any suggestions? This was the first upgrade to CM13. Hi , I have an OPO with oxygen 2.1.4 and oxygen recovery on it. Which file i need to download? rishad i have same problem did find any solution? Thanks! Helped me a lot ! I’m having problem with my opo as I’m on cos 13.0 and trying to update to 13.1 through ota update . But after downloading ota update I can’t install it and even ota update notification disappear. When I cancel sideload then ota notification appears but still the same thing happens. Please can anybody provide solution on this. My cyanogen os version is 13.0-ZN0EAS2JK.